What Coin Collecting Supplies and Accessories Will I Need? The most important coin collecting supplies you will need to start with are a good reference book, a decent magnifying glass, and a good light source. There are many reference books available. Be sure to choose one that fits your area of interest. When choosing a magnifier, get one that magnifies about 5 to 8 times (5x to 8x). This is the condition of a coin or amount of wear that a coin has received. , but anything that is lower than 5x will be too weak for you to see some of the important details of the coin and you might miss some of the smaller damage marks. A good choice for lighting is a 75 or 100-watt bulb that is 12" to 16" from your coin. Usually, less than 75-watts is not going to be bright enough unless you are using a special high intensity lamp. You should stay away from fluorescent lights altogether. There are a variety of other coin collecting supplies that you may eventually want to consider as your collection grows and becomes more valuable. I have touched on them briefly below to give you an idea of what is available in coin collecting supplies. As mentioned already, a good coin reference book is a must. A good coin grading book would also be helpful to carry with you to coin shows etc. where the internet is not readily available. There are also books available on many other aspects of coin collecting. See More About Coin Collecting Books. You might also consider subscribing to a magazine that is devoted to coin collectors and dealers. There are several available. See More About Coin Collecting Magazines. As your coin collection grows you will need something to keep the coins organized and protected. Software is available for your computer that will help you inventory and track your coin collection. It is hard to give advice as to the best software to purchase. It is usually just a matter of each users needs and preferences. Try to find one that offers a free trial period to see if it suits your particular needs. See More About Coin Collecting Software. This is a natural discoloration of a coin's surface caused by the atmosphere over a long period of time.. While it is not advisable to store coins of higher grades in these albums, they are perfect for beginners who are collecting lower grade circulated coins. Most coin collecting supplies are available online or at coin shops or hobby shops in your area. Coin Display Cases are available in wide range of sizes, shapes and materials and offter coin collectors a great way to show off their collections while protecting the coins in the collection at the same time. When you are just starting out, most of the coin collecting accessories you will need can be found in your own home. 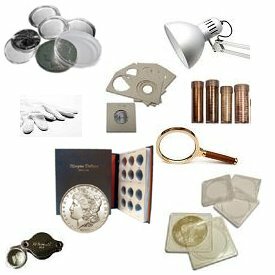 You can use envelopes, jars, bags or boxes for newer and less valuable coins that do not require any special handling or cataloging. A cigar box would be perfect for the beginner. Vinyl 2x2s, also called "flips"
A supply of surgical or soft cotton gloves to use when handling your coins. These will protect your coin from fingerprints and oils from your skin, which can cause unwanted marks and other damage, especially with more valuable coins. They are very inexpensive and readily available. A soft cloth or velvet pad to lay your coins on to prevent scratches and marring. As you can see, there is a wide variety of coin collecting supplies available. Just keep in mind that it is not necessary to have all of these things to get started in coin collecting. I have just listed a few things that you might find that you need as time goes on and your collection grows. When you first start your collection, you really only need a strong desire to learn about the type or series of coins you are interested in. You can learn a lot by surfing the internet. Eventually, however you will probably want a good reference book at the very least, so that you can carry it with you to coin shops and coin shows to have an easily accessible guide to the coins you are looking at.